We are SO LUCKY to be a part of such a large and loving barbershop family. Once again, the Fairfax Jubilaires’ annual chapter show was one of the highlights of our year. A new venue this year breathed new life into the program and we were so fortunate to be a part of an impressive line-up. The audiences for both the 2 p.m. show and the 7 p.m. show were so energetic and warm, and the chorus sure knows how to throw a heckuva party at the afterglow! 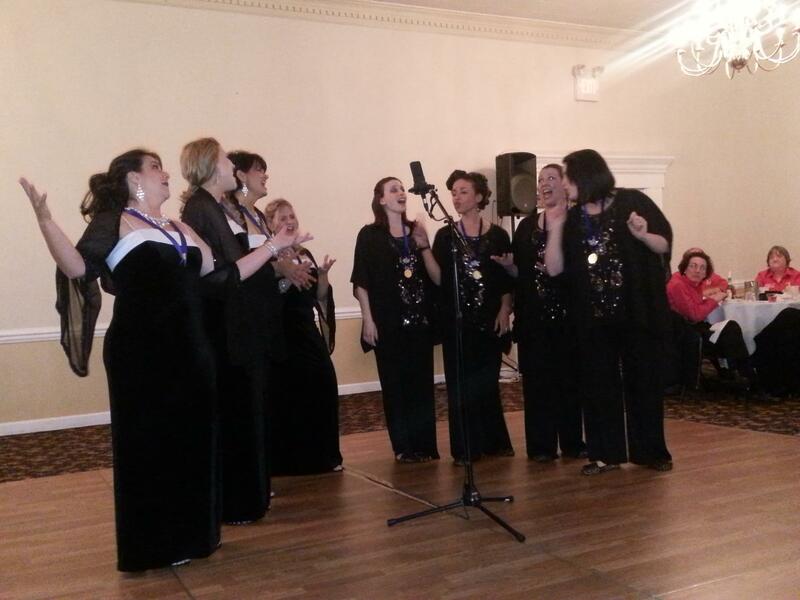 One of the highlights of our day, and it was a long time in the making, was singing an 8-part arrangement of “Anything You Can Do, I Can Do Better” with Sweet Adelines quartet Speed of Sound (go LIKE them on Facebook… you won’t be sorry). Arranged by the awesome Larry Wright, the tune is fun and sassy. It basically pits the two quartets against each other in a competition, fighting to sing higher, hold notes longer and sing sweeter! By the end, we decide to get along and deliver a big finish. We had so much fun getting ready for this song. Epic is located in the D.C. and Speed of Sound is not, hailing from waaaaayyyyy south of the Mason-Dixon Line! Thank goodness for learning tracks. When we got together before the show, the rehearsals were energetic and there was an instant chemistry between our two quartets. These chicks are CLASS ACTS. 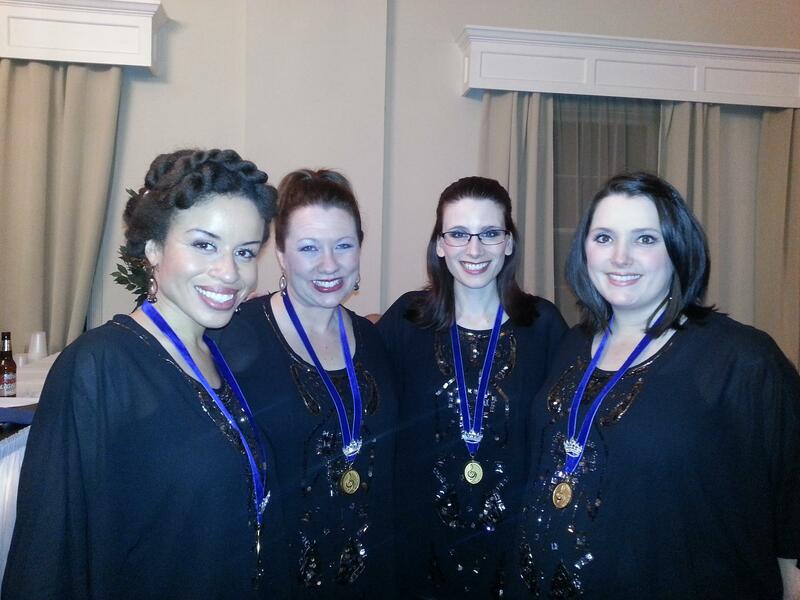 They are ranked well heading into Sweet Adelines’ International Competition in Hawaii (lucky them!) and we expect BIG things for Speed of Sound. They are talented, and they are good, good people. We were honored to share the stage with them and enjoyed just being in the audience as they did their thing on stage. We also helped pay back to the universe some of the “missed flight” karma that we racked up heading into our own International competition when Shana missed her flight out of D.C. to Florida. This time, Speed of Sound’s baritone, Carter, had flight drama from Florida to D.C.! She sped toward the show site in a taxi from Reagan airport just as the show was starting. Even though Epic was supposed to sing after the intermission, we partnered up with Speed of Sound and we all quickly decided to change spots in the line-up. Epic sang first, buying some more time for Carter. Just as we hit the stage, she arrived and slipped into her costume. They warmed up and hit the stage with energy FAR beyond what a weary air traveler has any right to have! We were so happy to repay the airline gods who got Shana to us in time for IC&C rehearsals by playing a small role in Speed of Sound having a successful show experience. A quick word about the guys of Da Capo. Anyone in the barbershop world and especially anyone in our neck of the woods knows just how special these guys are. Not only are they amazingly talented but they are great guys. They just posted a fantastic score at prelims and they are headed into their own International contest in Toronto this summer with loaded guns. We have made a bit of a Fairfax afterglow tradition out of targeting the baritone of the male guest quartet for Anne’s “One More Minute” solo. Last year, Anne sang to Larry Tulley (Boston Common, Our Town) and learned that he would escalate just as fast as she could. This year, Da Capo’s Joe Sawyer was a great sport and played an excellent “straight man” to Anne’s antics. A fine tradition, indeed! We’re trying to get the video pulled together and we’ll share it ASAP. We owe a deep and heartfelt thanks to our “boys” in the Fairfax Chorus. These guys hired us for their show last year just months after we formed. We barely had a handful of songs together when they contacted us in the fall of 2011 and asked if we would do the 2012 show. To come back again in 2013 is like coming home after a long journey. 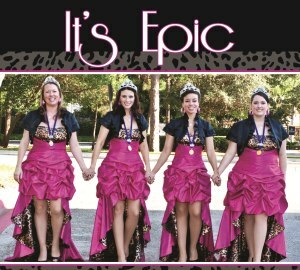 They believed in Epic before we probably believed in ourselves, and certainly long before we had any bling on our heads. Making them proud is one of our coolest accomplishments to date. We just love them all. We won’t go on and on, but we will say that it was just a good day to be an Epic. This quartet has already taken us on such a crazy journey and we continue to rack up memorable moments all the time. Yesterday’s shows and afterglow were just really stinkin’ fun. We were relaxed and chilling. The eyelashes went on without drama, Anne’s updo cooperated and everyone had all costume pieces except one black tank top (thank goodness Chris had an extra!). We even had a Starbucks right across the street from the venue!! Oh yes, a good day, indeed. Shana was working and multitasking, as always (she’s a busy chick). Anne was goofy and made about 100 new friends, as always. Mama Chris brought about $800 worth of food and snacks and took good care of us, as always. And pregnant Kris (Anne introduced her as the “Epic incubator” on stage! LOL) managed NOT to puke right on the evening show stage when the baby decided to shift and make a punching bag out of her stomach. Whew. Good day. Check out some of our pictures from the day. We’ll add more as we have them! Thanks to all who came, and thanks to those who supported us from a distance!